“Meatless Mondays” come and go around here without much notice, since we eat meatless meals most of the time. But I occasionally get comments about dedicated carnivores trying to add (or grudgingly accepting) more vegetarian meals into their diets. I acknowledge that I am supremely unqualified to comment on this topic, having eaten very little meat in the past two decades, but I imagine that it is hardy, “meaty,” vegetarian (vegan, even!) meals like this one that will appease even the most apprehensive carnivore. Try it. Let me know. And then once you have eased into occasional meatless eating, you can move on to advanced vegetarian fare, like those herbed Quinoa Cakes. Tempeh Tacos: Slice an onion into thin wedges, leaving the core intact to hold the wedges together a bit. Saute over high heat, stirring often, with a green pepper and a red pepper cut into strips. When the vegetables are well browned, add a package of tempeh strips (I like the Turtle Island brand) and continue to cook for a few more minutes until the vegetables are nearly charred in spots and the tempeh crisps up a bit. Add a handful of your preferred taco seasoning (I used our fish taco blend: 1 tsp. oregano, 2 tsp. cumin, 1 Tbsp. chili powder, 1/2 tsp. salt, 1/2 tsp. black pepper, and a Tbsp. brown sugar). Stir for a moment to toast the spices, then add about a quarter cup of water to deglaze the pan, scraping up all the flavorful crispy bits. 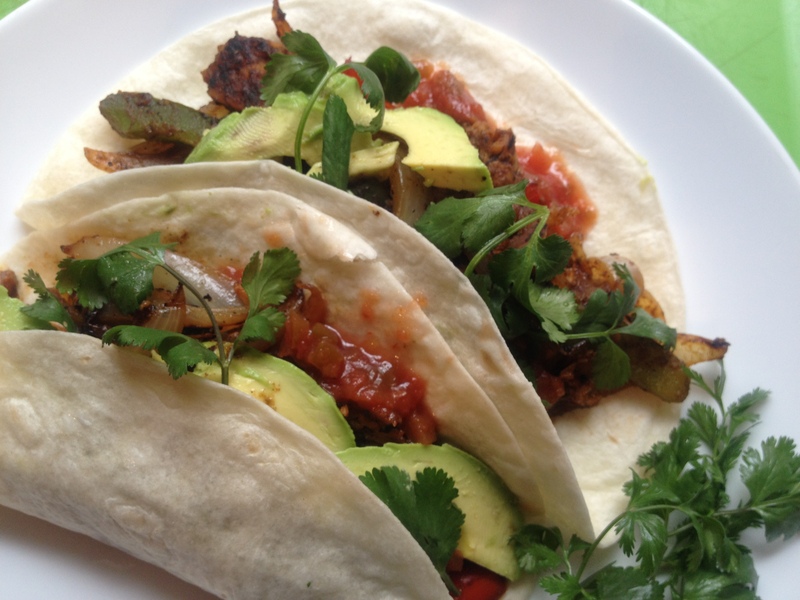 Wrap veggie-and-tempeh mixture in warm tortillas and garnish with salsa, avocado, and cilantro. This entry was posted in Mexican Flavors, Vegan or Would-Be-Just-As-Good-Vegan and tagged cooking, DIY, family, homemade, kids, lifestyle, recipes, tacos, tempeh, vegan, vegetarian on April 1, 2012 by emmycooks. OK, now I want tacos. But then again, I really like tacos, so these definitely tempted my tastebuds! Oh, Emmy, I am a game eater—vegetarian and otherwise. But my experience with tempeh was, well, not so good. Should I try again? It looks good, but I too have had some bad tempeh experiences. Nutty I like, but tempeh has always been so militantly nutty to me. I do actually love tempeh. It’s another holdover from my vegetarian days. Just like there is no real vegetarian substitute for bacon or sausage, there is not meat substitute for tempeh!